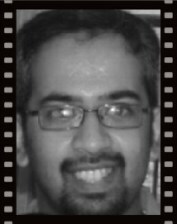 Jairam Mohan is somebody who pores over excel spreadsheets and power-point presentations in his day job, but believes his true calling is in boring people to death, hence, he updates his blog Mahabore’s Mumblings quite frequently. Between his wife and him, they nurture their 2 yr old daughter and the blog with snippets from their experiences with mythology, parenting and occasionally also dabble with some fiction. While it is reasonably well known that I regularly write about the great Indian epics and mythological tales, one standard assumption that most of my readers might have made about me would have been that I am a deeply religious sort of person. After all, someone who is not very religious will probably not read and write so much about the wonderful old mythological tales from the Ramayana and the Mahabharata, will he. And so when Corinne asked me to write a guest post for her blog, I immediately thought that this would be a good opportunity for me to put up something about my personal opinion about religion and spirituality in general. 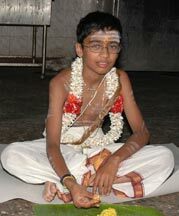 Coming from a fairly conservative South Indian Tamil Brahmin family it was inevitable that I was introduced to religion at a very young age. Starting from the fact that I was taught some Sanskrit shlokas at a very young age and my upanayanam ceremony (a Brahmin initiation ritual which symbolizes the transference of spiritual knowledge to the seeker) was done when I was 11 yrs old, most of my childhood was filled with good-hearted and well-intentioned attempts by my parents to make me a moderately religious spiritual child. However, the fact that I was growing up in a changing India and a cosmopolitan Bangalore meant that I hung out with quite a diverse set of friends ranging from North Indians, Indian Diaspora returned from Kuwait due to the Gulf War, Anglo Indians and the like, and this meant that I somehow never could quite latch on to the idea of organized religion as a concept. Although I did not rebel against religion and religious practices and become an atheist or anything like that, it was just that I did it just to keep my parents happy and didn’t quite pick it up the way my peer Tam Brahms did in smaller cities like Palakkad, Madras, etc. This meant that although I was part of the larger Tam Brahm community by virtue of my birth, upbringing, etc, I didn’t quite fit in with them as comfortably as I fit in within the cosmopolitan melee of Bangalore. That being said, the same cosmopolitan melee ensured that I developed a fair appreciation of other religions, other cultures, and ended up going to churches, mosques, gurudwaras, functions from all other faiths to which my friends belonged to and developed a decent understanding of the fact that God, as a concept advocated pretty much the same thing, albeit from different pulpits, altars, temples or mosques. And that, in my opinion has held me in good stead over the years. In recent times though, as life and its experiences have weathered my sensibilities, I now realize that ‘spirituality’ as a word encompasses so much more than just religion and religious practices. In fact, the same religious practices which I shunned and ignored when I was younger, I now realize are an easier way to become more spiritual. After all, it is next to impossible for all of us to develop the high levels of concentration and motivation required to focus, concentrate and meditate and bring our minds to a state of equanimity, where we treat everybody and everybody as equal in the eyes of the Creator. And this is precisely where some of our religious practices help us. By virtue of their inflexibility and rigidity, they enable us to become more disciplined with our habits, our thoughts, and coupled with the cosmopolitan world view that I grew up with, these practices help me maintain my sense of spirituality. When I read the great epics like the Ramayana and the Mahabharata, I don’t necessarily see Hindu Gods like Rama, Hanuman and Krishna in them, I see normal human beings being put in unusual situations and learn from how they react to them. Each one of these epics and the thousands of smaller stories within them are all lessons from which all of us can learn from. The insights that these characters and situations give into the human psyche are amazing and it is visible from the quality of comments that some of these posts receive on my blog. And that to me is spiritual lessons being put into practice. To conclude, am I religious, not really, but am I spiritual, to some extent, but I personally believe I have a long way to go and have only recently started taking the right steps in that direction. 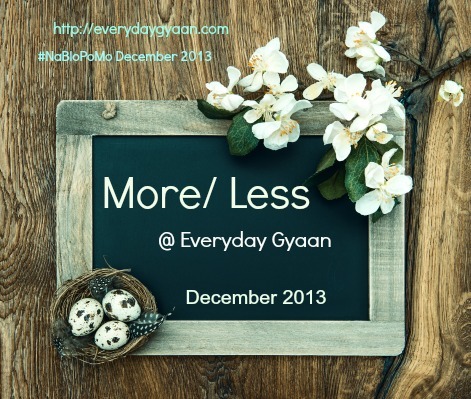 Post Script from Corinne: The theme for the December NaBloPoMo is More/Less and that’s what I’m exploring through December 2013. I will be writing on the subject of my own spiritual journey soon. Nice one, Jairam.. I can relate to several of the things mentioned.. but these days I have come to believe that one can be spiritual without being religious. Maybe it is the way that people (some, not all) have made religion a business, or maybe some hard learned lessons. Not an atheist really, more like an agnostic. Rekha, am truly and deeply humbled by the fact that you used a strong word like ‘respect’ to describe what you feel towards my posts. It speaks a lot for your humility and your willingness to learn from something like a blog. Thank you so much for the kind words regarding this particular post, and your consistent patronage of my writings as well. Really appreciate it a lot, means a lot to me. “the same religious practices which I shunned and ignored when I was younger, I now realize are an easier way to become more spiritual. ” – Very interesting. Never thought of is this way, Jairam. I am surely going to give this some time, and perhaps some reading, to understand this better. This post was essential for your readers for all the personal reasons that mention above. And also because it carries food for thought. You have done justice to Corinne’s lovely blog. What a wonderful post, Jairam. Enjoyed reading and soaking it! 🙂 I believe in God and in the power of prayers. It helps me feel connected and to be at peace. But I am not into rituals as prescribed by the religion. The road to spiritual journey is tough but guess with small consistent steps towards self discovery and reaching beyond current limits will help us grow mentally and emotionally! So true, but the fact remains that most of us nowadays simply don’t pull out time for self discovery in the first place apart from all our material pursuits, and that is quite sad, isn’t it? I have been learning this form your blog. I am not religious either. I light a lamp religiously everyday in the evening because it brings in peace . Going to temples sometimes, brings in peace too. But not the noisy crowded ones. I love the simple, small ones you find around a big tree , where you can sit and meditate for a few minutes. It is so humbling when readers comment that they actually learn from my blog, as my attempt is only to share my own learnings when I re-read these stories which I enjoyed so much as a kid. Thank you so much for the kind words Jyothi, really appreciate them. Corinne, thank you so much for hosting me and letting me share my thoughts about spirituality and religion. I am absolutely enjoying the comments and the thoughts that your readers are sharing on this post. Great post Jairam. I too am spiritual not religious, but I do believe that what we call “Gods” or some extremely evolved spiritual beings walked the earth. Yes they came in human form, but they were quite above us. The Ramayana and Mahabharata are my favourite stories of all time and each time I read them, I understand the essence of Spirit, the intricate Universe, the doctrines of karma and dharma, the understanding of life and purpose, more and more. My connection to the Great Spirit however is best done in solitude and silence away from religious ceremony and pomp. Your post has inspired me to write today. Thank you. That, to me, is probably the best way of connecting with the Great Spirit. After all it is a deeply personal connection and not something that needs to be publicized. I agree with your logistics and even I sail in the same boat with regards to spirituality versus religion. I feel that spirituality is more difficult/challenging to follow since it is comign from your heart verus just following the scriptures laid out to you. I wish you the best in this journey, jairam. Might just bump into you on the spiritual path….namaste! Corinne, another talented writer you showcased…jai ho! Absolutely, unlike religion which actually has prescribed norms, rituals and practices, spirituality is more on the lines of making things up as we go along and that is what makes it so abstract and so difficult to understand to most people I know of. Such a delight to see Jairam here…thanks Corinne! Thanks again Jairam for this post! btw, I am not religious, but I BELIEVE in God with every fiber of my being. From what I understand, spirituality is beyond physical and mental. And if prayers or rituals help us to become spiritual then it is wonderful. As you say, our epics have several nuggets of wisdom. The way you read them is perhaps the right way. A Mahawise post from Mahabore on my Mahafavorite blogger friend. Alka, my personal belief regarding spirituality also is that it transcends the physical and mental realms. As for our epics, all of them have so many multiple layers of interpretation and various hues and colors of lessons in them that one lifetime is probably not enough to read, understand and appreciate them. For me it helped that my parents weren’t too rigid and also didn’t follow all the customs and traditions blindly. I am a firm believer of God. But, I consider myself to be spiritual. I believe that its of no use following all those religious customs and traditions if one is not a person with good thoughts and actions. I believe that the best prayer and thank you one can offer The Lord us with good deeds and a pure heart free of malicious intent. Fabulous post and you have said everything precisely. I have never been able to write about my religious thoughts or upbringing with such preciseness! That is an extremely valid point and is the credo that I live with all the time. Although this was something that I have used as an excuse when I was younger to avoid religious rituals, it is only now that I probably fully understand the concept.